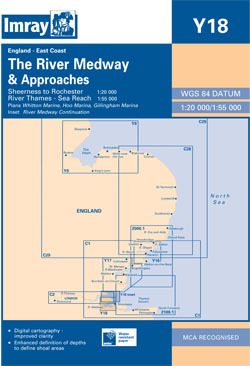 The whole of the River Medway from Sheerness to Rochester. Scale: 1 : 20,900. Small scale inset Scale: 1 : 55,450 of Thames Sea Reach. Larger scale plans of Hoo Marina and Gillingham Marina. On this 2016 edition the latest known depths have been applied throughout. The new Yantlet Channel gated buoy layout is shown on the River Thames Sea Reach panel.